It’s such a simple and small thing to say and these two small words cost you absolutely nothing yet make a huge difference to how and if people remember you – and respond to you. Thanking people is often the difference that makes the difference as to whether people do what you want, get back to you, take on your opinion and it certainly affects the way they do what you ask them to. To be noticed and remembered for the right reasons, we need to make people feel appreciated and an easy, effective and natural way to make people feel you appreciate them is simply to look for more ways to say ‘thank you’ and to say it more often. It’s simple and it works in so many different ways. Once you start to look for how and where you can be more grateful and more appreciative of what people are doing (not just for you but around you), you’ll discover lots more opportunities to say ‘thank you’. And, interestingly, staying open and looking for ways to say ‘thank you’, to be grateful. Even if you don’t always like what’s happened, there’s always a lesson to learn. Telling people you know they’ll do something and thanking them before they’ve done it, that’s where commitment and consistency, those powerful influencers, live. ‘Thank you’ also helps even if you don’t like what you’re being told. Try saying “ah, thanks for letting me know” or “hmm, thanks for telling me that, now what about etc.” If you say ‘thank you’ first, it means that the first thing you say isn’t negative and crucially, it buys you some precious time to decide what you do want to say. 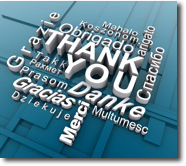 There’s a great knock-on effect from saying ‘thank you’ more as well; it makes you feel better too. It’s that whole ‘attitude of gratitude’ and it truly works. Simple. So many people mutter to themselves ‘well, they’re just doing their job, so why should I say thank you?’ or tell me ‘I was so pleased with how they did that’ and yet when I ask the person ‘did you tell them you’re pleased?’ they invariably say the person was either doing what they were supposed to or they just assumed the person knew they were pleased. Uh oh. A client told me recently that, as a service provider, when a customer phones her and says ‘thank you’ after she’s sorted things out for them, they immediately get better service from her next time they need her help. There you go, it’s that simple and easy. Thank you!